Quiz: Are You a Healthy or a Joyful Cook? Home > Cooking Techniques > Quiz: Are You a Healthy or a Joyful Cook? We’ve all been bombarded with health and nutrition messages in the last decade and for many people, that’s turned cooking from a pleasure to a chore. This simple quiz explores the balancing act between health and pleasure in cooking. Take a look through and mark the statements that apply to you. When you've finished, tot up your scores and check out your coking style. how important is it to ensure that it contains five fruit and vegetables and other key nutritional items? Somewhat important. As long as a diet is balanced over a day or a week, you can afford to let a few meals be pure indulgence. It can be useful but usually it’s possible to estimate these factors and a balanced diet has to contain some fat and sugar, just not to excess. Yes, a nice pudding or a lovely slice of cake puts everybody in a good mood and helps them feel they’ve been well fed. It’s easy to make a healthy sweet, such as fresh fruit and thick yoghurt, or a crumble with oats and nuts, which are satisfying and nutritionally sound. Yes and no, knowing what is in processed food is important to eating well, and understanding the nature of the ingredients you use at home is also a good way of making sure your diet is both tasty and healthy. Totally disagree - British cooking has a bad press but the current crop of celebrity chefs show that we can cook with the best of the rest of the world – we don’t need lessons in anything! People cook well or badly depending on their knowledge, but everybody could cook better if they had the confidence to experiment. Understanding ingredients is a great skill but not everybody gets on with formal training. People should just try out new dishes, starting with simple things like salads which are healthy and easy too. 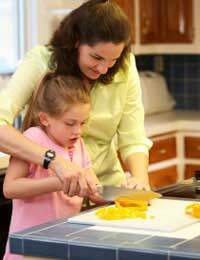 Mostly 1 – You are a healthy cook – you understands nutrition but may not be enjoying cooking as much as you could. As long as most meals are nutritional and healthy, you can relax and let yourself splurge on something reckless from time to time. Mostly 2 – You are a joyful cook – you obviously love to cook, and to eat, but you may not be considering the relationship between healthy food and happy life. It wouldn’t do any harm to look at where you can eat a little more healthily, such as using low fat products and substituting high sugar recipes for low sugar ones. Mostly 3 – You are a healthy, joyful cook – you’ve found the perfect balance between healthy ingredients and methods and pleasure in cooking and eating good food. Is Britain Eating More Healthily?